An interesting little tidbit surfaced on the Internet just a few minutes ago when Twitter’s Vice President, Business & Corporate Development, Kevin Thau, tweeted out a comparison shot between Twitter and Facebook. The subject of the tweet was Serena Williams, whose Twitter profile Thau seems to feel is more authentic than her official Facebook page. 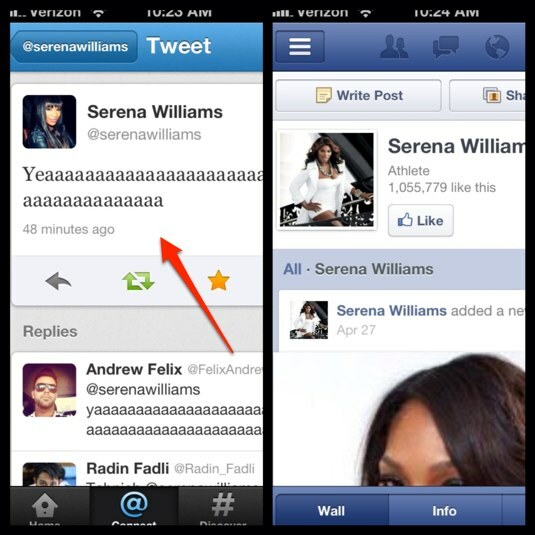 But the interesting bit about this screenshot isn’t the super authentic yelling that Williams appears to be doing on her Twitter profile, it’s that the screenshot of Twitter for iPhone on the left doesn’t appear to be the shipping version, but an internal build that could very well be the next version of the app. 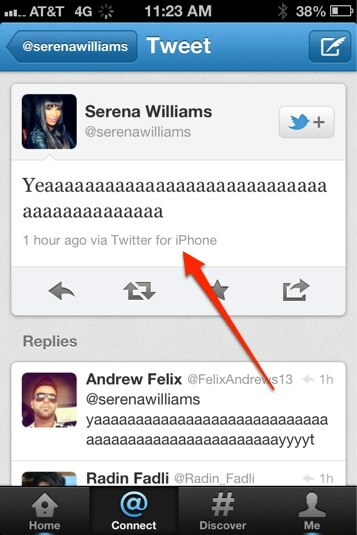 So, this appears to be an internal build of Twitter for iPhone. But what does the omission of the client stamp mean? I’ve got a few thoughts. It could be nothing. The internal build that Thau is using could have the stamp display off for testing or technical purposes and this could be a look at an iteration of the client that looks pretty similar and is otherwise unremarkable. This is a strong possibility. It could be a change that they are indeed making. If so, it could be an effort to de-emphasize the importance of Twitter clients. Twitter wants you to see a tweet, but doesn’t want to highlight where that tweet came from. The experience would end up being ‘more cohesive’ because any Tweet is just ‘via Twitter’ and not ‘via Tweetbot’ or Twitterrific or any other client. The stamp drives downloads and adoption of third-party clients. If a tastemaker or Twitter celebrity tweets out ‘via Tweetbot’, people are likely to look up that client and perhaps switch away from the official versions. Twitter likely doesn’t want to keep promoting clients outside of its own, so it’s removing the stamp. The doomsday scenario. Twitter plans to make the official Twitter clients for iPhone, via iOS and whatever other platform the only clients that allow tweeting. This would mean that third-party Twitter clients that use the timeline and compose tweets in ways that mimic the official clients are end-of-line. It’s a design decision. Perhaps the design team is trying to clean up the single tweet view in the official clients and it felt that the stamp wasn’t necessary. This statement, and a couple of others in the post, caused many third-party Twitter developers I spoke to categorize the post as ‘ominous‘ and Twitter’s new direction as a potential threat to the ways that many of them use its API. Since then, we’ve all been waiting for clarification, but none is forthcoming. At this point, it’s wait and see for developers and little details like eliminating the ‘via client x’ in the next version of Twitter for iPhone aren’t likely to allay their fears.